This is a quick recipe that took about 40 minutes. While the vegetables are in the oven, prepare the pesto, then the pasta. 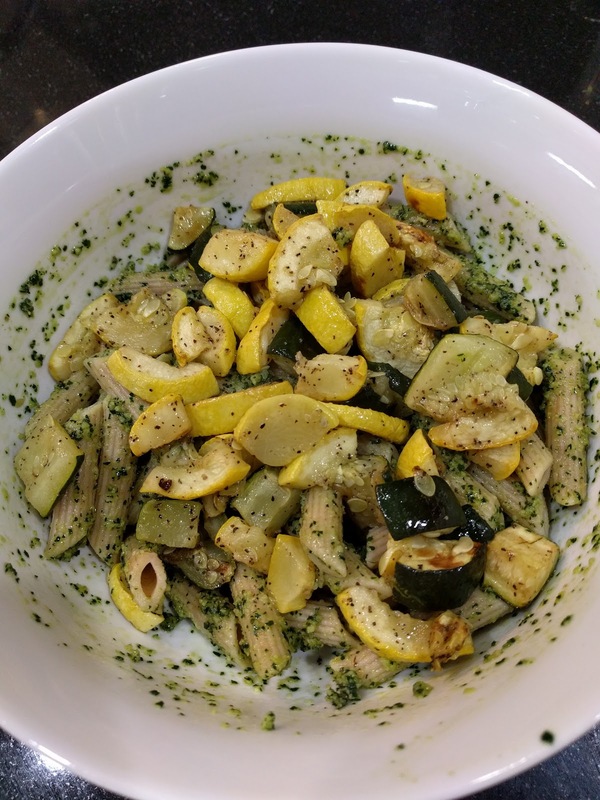 Quarter then slice to ½­ inch ­thick the squash and zucchini, then put in medium prep bowl. Place 1/4 cup pecan, 1/4 vegan Parmesan, 3 peeled garlic cloves garlic into a prep bowl. Trim chard from stems, loosely chop, then put in prep bowl. Trim sage from stems and place in a prep bow. Brush or spray a large oven baking sheet with thin layer of olive oil. Preheat stove medium pot of boiling & salted water. ⅛ tsp. each of black pepper and salt into a prep bowl. Toss yellow squash and zucchini with oil, and spread on large baking sheet. Roast in oven 20-25 minutes until browned, turning once or twice. In medium pot of boiling water and salt, blanch rainbow chard water 3 minutes. Rinse under cold water, drain, pat dry, then add to sage prep bowl. Put pecans, vegan parmesan, and garlic in processor bowl and pulse until finely chopped. Add add rainbow chard, sage leaves, and pulse until finely chopped. With food processor on, add oil slowly until looks smooth. Lastly, add pepper, salt and dash of enchilada sauce. Drain, and reserve 1/4 cup cooking fluid. Toss penne with reserved pasta cooking water and prefered amount of pesto. Left over pesto can be refrigerated or frozen for later. Divide pasta among bowls, and top with squash.